Last night we arrived home from our annual spiritual retreat in the Dominican Republic. We left home at 6.30am on Saturday morning and travelled to Vaudrieul where we met with the other OMS missionaries and got on the bus for the 6 hour journey to Sosua. We had just arrived in Vaudrieul when I realised we had forgotten teddy.....Anyone who knows Sam knows teddy is very important! 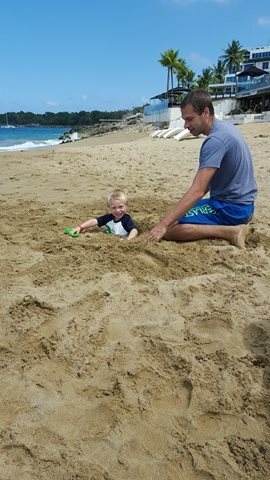 Teddy is an international traveller and has been in Canada, America, Scotland and England and he wasn't going to miss out on this opportunity to go to the Dominican! 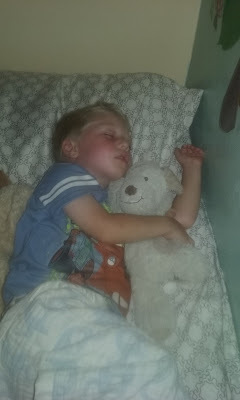 Bill and I were not looking forward to bedtime with no teddy so asked Phil to go to our house and bring teddy, 15 minutes later teddy arrived on the back of a motorbike ( I wish I had a photo of that!!) and got a big cheer when he did! Then we were able to get started on our journey. Our speakers were from an organisation called Soul Care whose role is missionary care. They focused on how we can work better as a team to understand each other and work towards a common goal which is to share the gospel here in Haiti. The rest of our time was spent swimming, going to the beach and for us getting to know the other missionaries better. We live at EBS which is in a village called Sakenville, most of the OMS missionaries live in Vaudrieul which is where the clinic, we only see them once a week so it was a good opportunity for us to spend time with the rest of the team. I love Joel's wee face when Bill's throwing him in the pool...love it! So glad you guys had such a good and restful time! !